The Life Plan is based around the concept of ‘The Wheel of Life’. A wheel turns smoothly and effectively when each spoke is in excellent condition, strong and purpose built. Without this equilibrium the wheel turns awkwardly, laboriously and often painfully. To maintain our equilibrium we must ensure that when a change occurs our decisions consider all aspects that are important to us. So when making a career change, consider how the choices will influence your finances, health, time with family and friends etc. 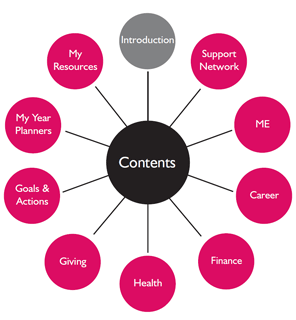 The Life Plan helps identify strengths, transferable skills, motivators, brand, drivers and many more. Goals and Actions – Try it!